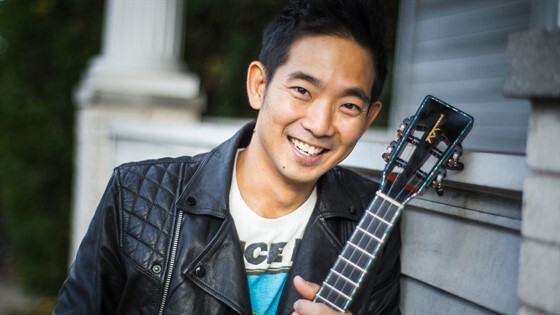 Jake Shimabukuro (she-ma-BOO-koo-row) is recognized as one of the world's most exciting and innovative ukulele players and composers. Renowned for lightning-fast fingers and revolutionary playing techniques, Jake views the ukulele as an "untapped source of music with unlimited potential." His virtuosity defies label or category. Playing jazz, blues, funk, classical, bluegrass, folk, flamenco, and rock, Jake's mission is to show everyone that the ukulele is capable of so much more than the traditional Hawaiian music - or corny showbiz routines -- many associate it with. Shimabukuro became a local phenomenon in his native Hawaii, with his fame then spreading to Japan. He was signed to Epic Records (Sony/Japan) in 2001 as a solo artist. It was the start of what would become a deep catalog of solo albums, noted for their dazzling fretwork, ambitious repertoire and wistful melodicism. And in 2005, Shimabukuro became an international phenomenon when a video of him performing the George Harrison song “While My Guitar Gently Weeps” went viral on YouTube. Shimabukuro’s busy touring schedule-140 dates a year-is complemented by a rich and varied catalog of albums that capture the many moods of the uke. His most recent CD, Nashville Sessions, is one of his most adventurous, multifaceted and engaging records to date, blending elements of jazz virtuosity with heartfelt melodicism.